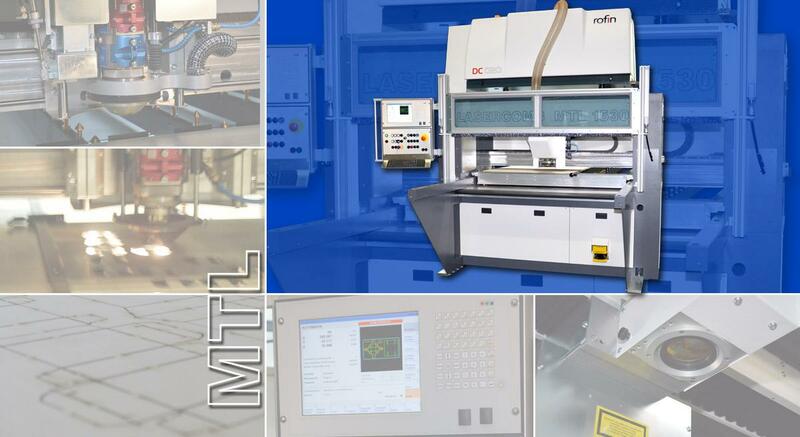 The compact laser system MTL offers proven precision and quality by Lasercomb in combination with a machine concept designed for high dynamic and productivity. Another advantage of this machine type is low space requirement especially our model with the laser source on top of the machine. The cutting area is secured by a door. The traversing range is safeguarded by sensors and protective grids. Consequently, the system offers highest standards also with a view to occupational safety. The value for money is very attractive as well. Favored by a compelling concept we can provide outright interesting prices for all models and options. The system is available in various models and sizes. Therefore you can configure your system according to space conditions. Operation occurs on a graphic user interface which is comfortable by means of a touch screen and has an intuitive operator guidance. Input of required parameters for material and incision is logically and clearly structured. Extensive hedging methods help to prevent unintentional mistakes. In daily operation, the next step is defined and the machine is ready to operate with a minimum of inputs. This is supported by extensive material and parameter data bases. Cut corrections can be applied at any time. The machine is working on the network which allows easy data transmission and besides enables us to support you by remote maintenance. According to different requirements by every company we provide various extensions and additions to our MTL series. A MTL by Lasercomb will provide security of investment on long terms and will enable you to adjust your system in retrospect for the latest requests. Our MTL system can be adjusted for your requests by means of various additions. Therefore the following options are available. An ever-increasing amount of information is engraved on the cutting die. Especially markings are extremely time-consuming because of low movement speed according to very detailed contours. With this option, we offer the opportunity to drastically reduce processing time of engraving. Laser beam is moved with speeds of up to 12m/s (720m/min) by means of a galvanometer scanner. Thereby in each case is a quadratic partial surface for example 200 x 200mm labeled. After that the scanner unit is repositioned and the adjacent partial surface gets labeled. Division in partial surfaces is fully automated. Conventional engraving by laser nozzle can be used optionally. Fast laser engraving of labels, position marking, line numbers, logos, etc., special engravings on various materials. With this option, you can capture fiducial-/ print-marks and analyze their position. The current application can capture 2 print marks per file. e.g. contour controlled cutting of digital prints or flag fabric ,etc. Cutting steel sheets on the laser system is a frequently requested application. In our opinion the MTL is particularly suited by means of the Precitec nozzle which works with high pressure up to 25 bar and the cartridge system of the nozzle which makes easy replacement of lens and focal length possible. Furthermore, there are additional options available which facilitate machining steel sheets or rather metallic materials. The system will get equipped with additional cutting gas ports for oxygen and nitrogen. Our Lasercomb nozzle will be used and for metalworking a second lens holder with 5 1/4’’ high pressure lens will be provided. Additional material tables will be displayed on the operator interface where specific metalworking parameters can be recorded. The cutting gas circuit is flushed automatically while rearranging. The system will get equipped with additional cutting gas ports for oxygen and nitrogen. A Precitec high pressure nozzle will be used with a cartridge system for easy replacement of lens. Additional material tables will be displayed on the operator interface where specific metalworking parameters can be recorded. The cutting gas circuit is flushed automatically while rearranging. The focal position can be operated contactless thus damage of the surface by a gliding shoe can be avoided. A simple support grate is included in the scope of supply for steel option 1 and steel option 2. This grate can be applied into the system to facilitate and improve laying the sheets. Valuable to improve and stabilize laying of smaller cutting dies and processing cutting die remnants. Our software DiePacker which is integrated in the operator interface enables you to combine different cut files in one single file. Operator guidance is easy and efficient. The benefit of the software resides in the improvement of material utilization and longer runtime of the system without intervention by machine operator. Thereby you can achieve noticeable improvements of productivity especially when smaller dies are frequently cut. Adjust your cutting head according to your current requests! Get informed about possible options.